The weather was set to be rubbish this evening, so Dan and myself headed for the Wandte with a plan to fish until it started raining then head for home... The rain didn't arrive so we didn't leave! We added four more barbel to the challenge, 2lb 4oz, 3lb 0oz, 1lb 0oz (to Dan) and finally a fish that broke the four pound barrier, 4lb 2oz. 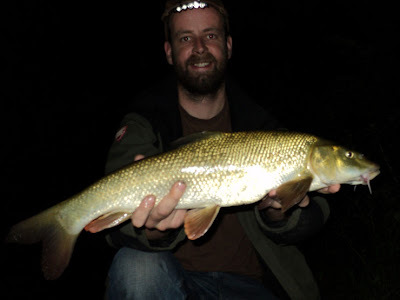 Dan also managed a eel of about half a pound, and lost several more barbel - his luck hasn't improved! 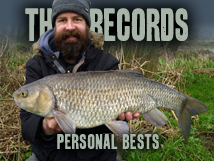 So the challenge now stands at sixteen fish for 27lb 1oz. Following the advise given to me both on this blog and from the guys on the riverbank I think we'll be heading off downstream next time - thanks for all the advise everyone. And keep it coming - we need it! Cheers Paddy, we've landed a four - the next target is a five. Dan has been truly unlucky so far this season, I think we all go through an extended period of bad luck from time to time during our fishing seasons. He just needs a good fish on the bank to break the cycle!